We’re on a shortcut kick. Cut us some slack: I’m days away from my due date, Laurel just launched herself back into full-time training, and Melissa is recovering from weeks of the holiday entertaining of her not only her three kids but multiple sets of relatives. We’ll get back to cooking projects and more intricate recipes (someday!? ), but for now, healthy dinners that can be made in 20 minutes and eaten hot or cold**, from a single bowl are our jam. That’s where this noodle bowl comes into play. The foundation is a takeaway side order of rice noodles from a local restaurant. Ok, my local restaurant happens to be Blue Ribbon Sushi - can’t help it, it’s on my dog walk route! Plain noodles from any noodle shop, sushi bar, or Chinese restaurant would do, and so would making your own ramen, rice, or soba noodles (but we’re on a time & energy budget here, right?). I buy freshly cut (by the grocery store) broccoli florets - either from the salad bar or produce section. Sure it might be a little more expensive, but there’s no wasted food or time. To further save time, I roast the broccoli and the shrimp on the same baking tray. And for seasoning, our Citrus Vinaigrette, made ahead of time, does the trick. **This will be key once the new mom diet kicks in later this month. As most new moms know, sitting down for an entire, uninterrupted meal NEVER happens. Dinner usually starts out warm, but by the time it’s finished (if it gets finished), it’s been in and out of the refrigerator several times. This noodle bowl holds up to that test. Prepare broccoli by tossing it with olive oil and sprinkling it with garlic powder and a pinch of red pepper flakes (full recipe here). Prepare shrimp by rinsing, adding a squeeze of lime juice, then rinsing again. Toss with 1-2 teaspoons of dressing. Put seasoned broccoli on baking tray and place in oven. After 5 minutes, remove and add shrimp to the tray. Bake an additional 8-10 minutes until shrimp are cooked through. In the meantime, defrost edamame (if frozen) and toss it with the noodles and dressing (amount of dressing up to you). 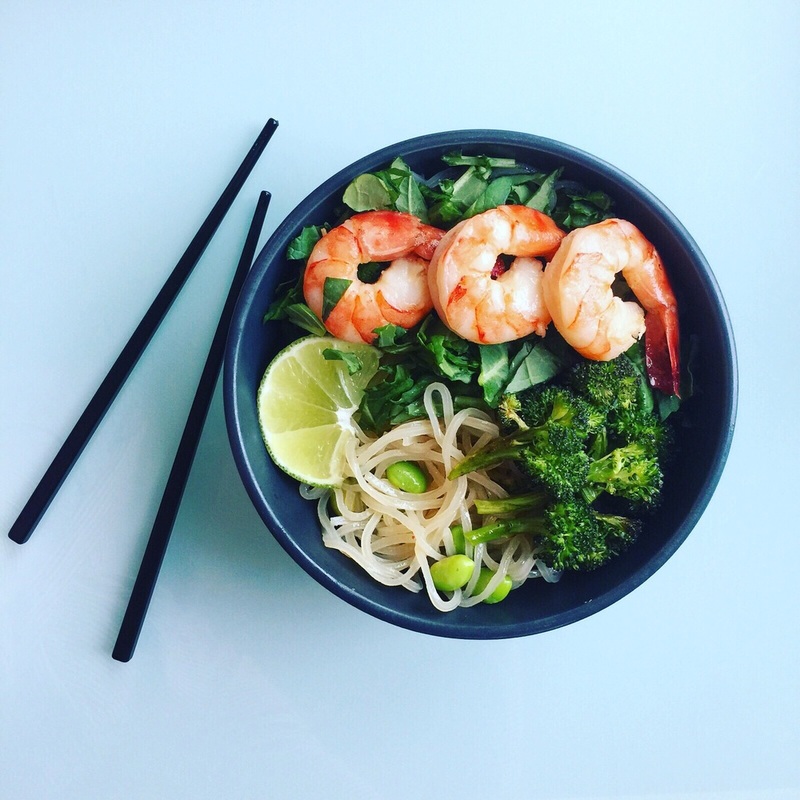 When shrimp and broccoli are finished cooking, assemble bowls by arranging kale, broccoli, and shrimp on top of the noodles. Serve with a lime wedge. Jan 6 We're Heading to Blackberry Farm - Join us!